A total of 885 British leaf, stem, twig, bark and samara miners are included in this account. A total of 1, 100 insects are discussed, although not all are miners as all agromyzids recorded in Britain and Ireland whether miner or not are included. Keys are provided for the identification of mines on 675 of the 882 host plant genera discussed, although for 107 of these host plant genera the keys to Diptera and non-Dipera are separate. No keys for the identification of the mines are included for the reminaing host plant genera, as although they may include miners elsewhere they either do not occur in Britain or they are treated elsewhere under a different name. 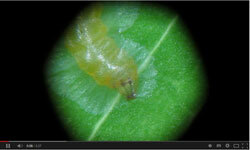 An additional key is provided to the species of Liriomyza recorded in glasshouses and/or quarantine interceptions. If in doubt, rear it out! Checklists are provided for all insect species discussed by Family, Genus and Species. Agromyzidae names in the latest Checklist of Diptera of the British Isles, if missing, have now been added to the Checklists by Family and Genus (11-05-2018). Checklists by scientific and common name (where they exist) are given for all host plants. The synonymy and known host plants, biology and distribution, where known, are given for all species included, along with a list of known parasitoids. These lists are currently being updated. Galleries of images of mines now exist for more than 600 species. These images are mainly sourced from Bladmineerders en plantengallen van Europa and British Leafminers, but include some originals taken by Brian Pitkin and many others (see Acknowledgements). Images of immature stages and adults are included where available. More images are needed to enhance the keys and species accounts and the presence or absence of images is included in the checklists. The morphology of the immature stages of miners is briefly discussed and illustrated. Links from 291 of the 327 illustrated host plant species are provided to the Interactive maps in the Online Atlas of the British and Irish flora, showing their distribution. Links to images of host plant species in British Wild Flowers by John Somerville et al. are also provided. Links to BSBI's plant crib is provided for 193 of 675 host genera discussed in the Keys. Links, where they exist, are included to species accounts in Bladmineerders en plantengallen van Europa (formerly Nederlandse bladmineerders and Bladmineerders van Europa), British Leafminers (including 243 links to The National Leafmining Lepidoptera Scheme distribution maps) and UKMoths. Links (where they exist) for all species are given to the Biodiversity Heritage Library, Encyclopedia of Life, Fauna Europaea (including distribution lists by country), National Biodiversity Network, The Natural History Museum's UK Checklist, Ireland's National Biodiversity Data Centre (including 241 interactive maps of moths), the Universal Chalcidoid Database, Google, Google Scholar and Google Images. Links to Coleoptera in Invertebrate Ireland are included for 20 of the 38 beetles. Methods used are described, but please note this is a work in progress. An annotated list of references is included, but please note this is a work in progress. A list of web resources is also included. You can search this site or the internet for any word combination using Google. If you notice any errors or omissions please contact Brian Pitkin. There is hyperlink to his e-mail address at the foot of every page. Just click on his name to launch your own e-mail application. Please quote the name of the insect, parasitoid or host plant in the subject of your e-mail.